Does anyone else watch Army Wives? It’s a pretty decent show on Lifetime that airs Sunday nights. It’s about army families and specifically about the wives who have close knit relationships with one another. One of the main characters, Claudia Joy, was diagnosed last season with type 2 diabetes. She began on insulin injections and much of the season focused on her management of the disease. Flash-forward to the most recent episode where she was diagnosed with kidney failure and had to start dialysis. As I sit there, nearly in tears, it comes to me — this is the life my patients lead. Most of them have diabetes and all of them have been given the news that they will need dialysis (or a transplant) to live. Of course I “know” all this but “seeing it” was eye-opening. Then today, I was talking with the dietary manager and RD at the long-term care facility I’m teaching at this quarter when we got on the topic of how dialysis patients always end up being told they can’t have their favorite foods and how difficult it is to stick with such a strict diet for the long haul. Sad. 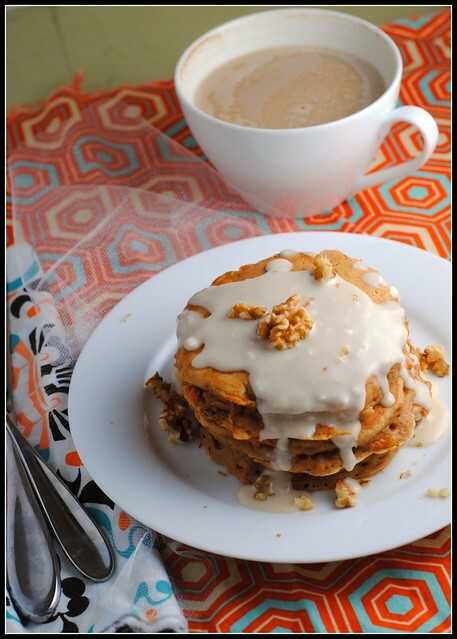 What the heck does all of that have to do with Carrot Cake Pancakes with Cream Cheese Glaze? Quite a lot, actually! Sadly, a lot of fruits and vegetables are either high in potassium or phosphorus…or both. Chocolate and caramel are much of the same. As is cheese, milk, and other dairy products. Nuts are a no-no, too. All things considered, this makes (nut-free) carrot cake a good dessert (or breakfast!) choice for my patients. While it’s often hard to find renal recipes, these pancakes made with all-purpose flour (wheat is high in phosphorus) and without nuts would be a great breakfast option. Not only great…but epic. It’s been awhile, but this is another epic breakfast. Mr. Prevention SWEARS that I’ve made carrot cake pancakes before. I don’t recall, nor can I find them on my blog. Regardless, they clearly weren’t memorable. After these pancakes, I have awoken every morning since wanting these and nothing else. While it’s true that carrot cake everything makes me weak in the knees, I just can’t express how perfect these turned out. 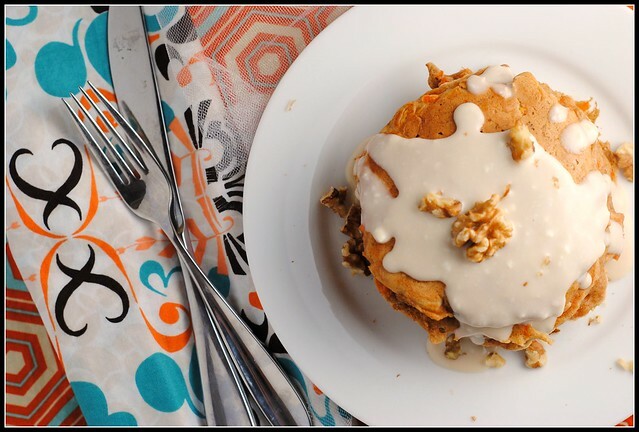 My dad sings my praises about a lot of things (I am Daddy’s Little Girl), but “my” Carrot Cake Pancakes with Cream Cheese Glaze may be what he brags about to people in the years to come. Obviously the man has excellent taste in food. My mom…I wasn’t so sure about. I tend to think of her as more of the savory breakfast type, but she surely wasn’t complaining! In a medium bowl, whisk flour, sugar, cinnamon, baking powder, baking soda, and salt. Set aside. Add dry ingredients to wet ingredients and gently stir until blended. Fold in carrots and walnuts. Let batter sit for 10 minutes. Microwave the cream cheese for about 15-20 seconds to soften. Whisk the remaining ingredients for the glaze, adding additional milk, if needed, to thin. Meanwhile, preheat large nonstick skillet or griddle to medium heat. Pour batter onto griddle using a 1/4 cup measuring cup, spreading the batter with the flat bottom. Flip pancakes when tops are covered with bubbles and edges look cooked (about 2-3 minutes). Cook the other side until set (about 2 minutes). Serve warm with cream cheese glaze. Yield: 7 servings (2 pancakes each with about 1 1/2 tablespoons glaze). Result: Epic! Must make recipe! 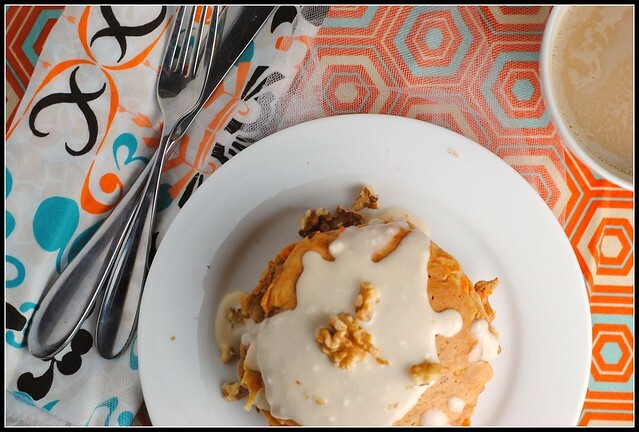 If you love carrot cake…these are for you! I’m very pleased with the nutrition stats, too — nearly 6 1/2 grams of fiber and only 365 calories…including the glaze! The batter is thick, don’t be alarmed. I like to use a 1/3 cup measuring cup to pour the batter and then use the bottom to spread the batter into a 5-inch pancakes. Enjoy! Please be sure to stop by tomorrow…exciting news and celebrations will ensue! WHOA! Talk about a major blood sugar spike!! I would bet that this is worth it though 🙂 I LOVE carrot cake. IF you end up coming to our wedding you will learn that we have two cakes; one wedding and one carrot (because no wedding is complete with a carrot cake!!). 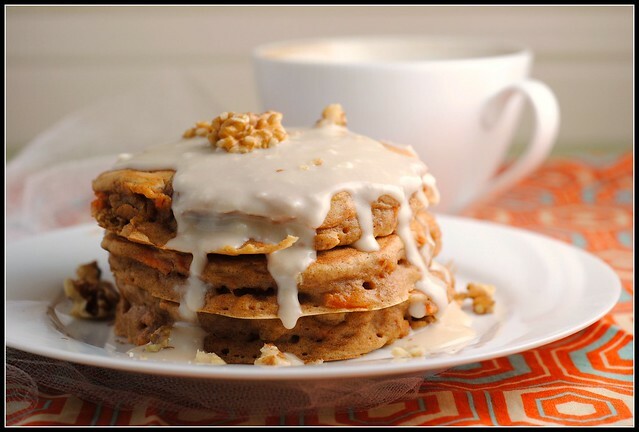 just wondering if you know the phosphorus and potassium content for the carrot cake pancakes with the cream cheese glaze? i am always looking for recipes–my husband is on the kidney transplant list and getting ready to start dialysis. they look great! I wish my husband would enjoy breakfast for dinner so that I could make these. Weekend breakfasts don’t often work for us because 1) he isn’t much of a breakfast eater and 2) I’m off running many mornings while he’s sleeping. I think my son woke up every morning wanting these as well! 🙂 I am so glad you and your family enjoyed the recipe! Most of my friends are like your mom- and prefer the savory breakfast option. Which is unfortunate, because I have soooo many awesome decked-out pancake ideas I’d love to try! These look wonderful! Just the idea of cream cheese glaze alone would make me go nuts. My Mr would absolutely flip for these!! I think I’ll surprise him with these this Sunday! Carrot cake makes me weak in the knees too. By far my favorite dessert when it’s laced with cream cheese icing…These would definitely be motivation to get out of bed! Those sound really good! I bet they’d even be good with just maple syrup on top. I’m excited to hear your news tomorrow! Between Army Wives and Paula Deen this may be the year diabetes gets its much needed media attention. Hopefully that might help people make good decisions before things start going south. I haven’t watched army wives. But gosh, just you telling me the story, I wanted to tear up. This is a winning recipe. 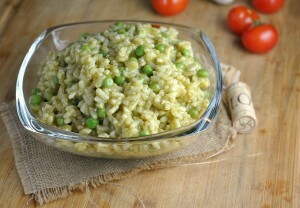 I think I’ll make this for one of my SIL’s lunches next week – love that they reheat well! Still so excited about your news tomorrow! I think cream cheese icing may be my favorite thing in the world, so turning it into a glaze for pancakes is just a good idea all around. These sound amazing. Mmm I recently made carrot cake waffles and loved them. Will have to try the pancake version too. Breakfast of champions! That’s quite the stack of pancakes! And if they are a healthier option (especially the 1 tbsp of sugar), I’d consider tossing out my regular pancake recipe! yum! I bet these would be awesome as waffles too. These look amazing! Wondering, are whole wheat flour and whole wheat pastry flour nutritionally the same? Do you use pastry for a lighter texture? My brother in law actually has kidney problems, not diabetes(yet) but he still has to watch what he eats. Every time I read or hear about it, I realize I really know nothing about what foods he can and can’t have 🙁 So sad! OMG! These look unbelievable. I pinned them about an hour ago and it’s been re-pinned by 37 people already!!! I definitely would prefer this type of breakfast over ANY! And, lucky for me, so would the hubs. 🙂 Looks fabulous, Nicole! 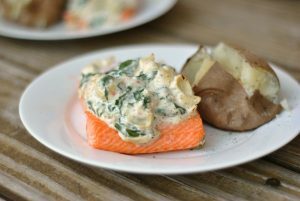 I’m so glad I had a chance to make these – they were delicious!